And the winner is… men. That might sound unlikely at an awards ceremony to promote gender equality, but it’s exactly what happened in the United Arab Emirates on Sunday. 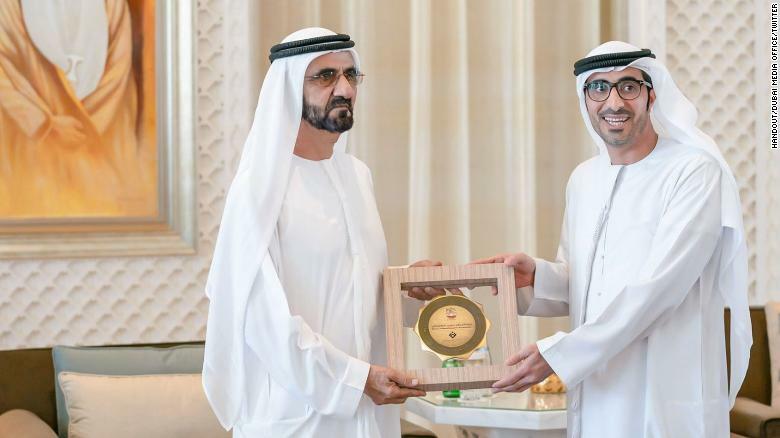 Sheik Mohammed bin Rashid al-Maktoum, the vice-president of the UAE and ruler of Dubai, presented prizes to award winners at the Gender Balance Index 2018 in three categories, all of which were collected by men. Award for Best Federal Entity Supporting Gender Balance went to the Federal Competitiveness and Statistics Authority and was received by director general Abdulla Nasser Lootah. Awards for Best Personality for Supporting Gender Balance, Best Federal Entity for Supporting Gender Balance, and the Best Initiative for Supporting Gender Balance were part of an event designed to celebrate initiatives and programs that promote equal opportunities for men and women, according to a government statement. The best personality award was won by Lieutenant General His Highness Sheikh Saif bin Zayed Al Nahyan, Deputy Prime Minister and Minister of Interior, for his work to introduce maternity leave for female soldiers in the UAE armed forces. “We are proud of the success of Emirati women and their role is central to shaping the future of the country,” read a tweet from the official Dubai media office. Award for Best Initiative Supporting Gender Balance went to the Ministry of Human Resources and Emiratisation. It’s received by government minister Nasser bin Thani Al Hamli. However social media users were less impressed. “Tell me this isn’t a subversive satire on gender balance politics, patriarchy & #manels,” wrote Gerry Hassan on Twitter, referring to the phenomenon of all-male panels at seminars and events. “So deluded you can’t even see the irony here,” said Lebanese academic Joey Ayoub. The Dubai government has not yet responded to a CNN request for comment. While photographs from the event sparked criticism, it’s worth pointing out that two of the awards were won by ministries, not individuals. The ministries were represented by men who received the prize on behalf of their team. And the UAE is doing better than many countries in the region when it comes to gender equality. In 2016, the Middle East had the world’s lowest rate of female participation in the workforce at just under 22%, according to the World Bank. However the picture is brighter in the UAE, where almost 42% of women work, not far off the global average of 49%. And 66% of public sector workers are women.